Maryland's Ralph Friedgen got fired after leading the Terps to the greatest turnaround in ACC history. The Maryland Terrapins sent coach Ralph Friedgen out as a winner in his final game, defeating East Carolina, 51-20 in the Military Bowl in front of 38,062 fans at RFK Stadium Wednesday. Friedgen, the 2010 ACC Coach of the Year, was fired by Maryland Monday. Senior running back Da’Rel Scott rushed for 201 yards including touchdown runs of 61 and 91 yards. Redshirt freshman D.J. Adams added four more touchdowns on the ground, and Maryland’s defense held the Pirates to 38 yards rushing as the Terps (9-4) sent Friedgen off with a 5-2 mark in bowl games at Maryland. Friedgen got a Gatorade shower from his players on the sideline in the game’s closing minutes. “It’s like everything else I did this week. It’s the last time,” said Friedgen after the game. “Maybe it’ll happen somewhere else but it’s the last time at my alma mater, so it’s meaningful there. I can’t tell you how much I appreciate the fans coming out and supporting me, and the letters and emails and the texts I’ve gotten have been incredible. That Maryland would fire its longtime coach after a seven-game improvement over last season is not only disloyal, but also highly questionable. It’s uncertain whether a new coach will have significantly better results than Friedgen, who led the Terrapins to bowl games in seven of his 10 seasons. In fact, a new coaching staff could result in fewer Terps playing in the NFL, which could ultimately hurt recruiting. 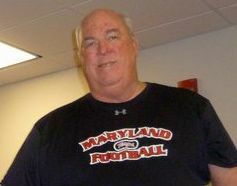 Friedgen, the 2001 National Coach of the Year, was fired despite improving Maryland’s record from 2-10 in 2009 to 9-4 this season, the biggest turnaround in the history of the ACC. Maryland had only played in one bowl in the previous 14 years before Friedgen’s arrival. Maryland is expected to hire former Texas Tech coach Mike Leach, whose Red Raiders played in bowls for 10 consecutive seasons but was fired a year ago for allegedly mistreating a player. 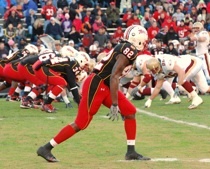 Maryland's Torrey Smith, seen here vs. Boston College in 2009, scored four TDs Saturday in the Terps' 38-31 win over N.C. State. Photo: Keith Lovett via Flickr. Torrey Smith caught four touchdown passes from Danny O’Brien as the Maryland Terrapins defeated the N.C. State Wolfpack, 38-31 Saturday in College Park, Maryland. The Terps will likely play in the Military Bowl in RFK Stadium in Washington, D.C. Dec. 29. Maryland will play in its seventh bowl in coach Ralph Friedgen’s 10 seasons as coach.